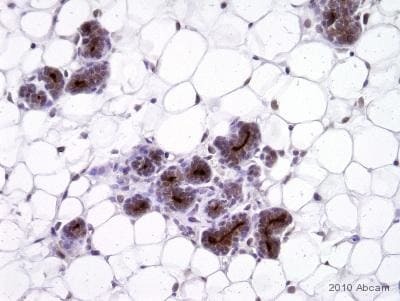 No siganl in IHC-P on mouse tissue. 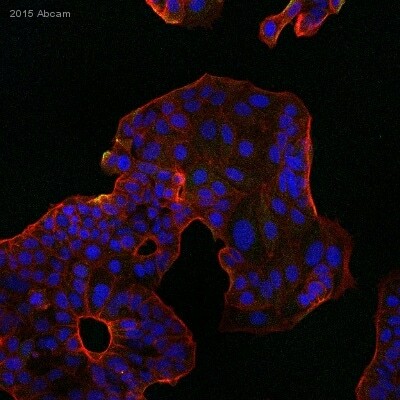 I am sorry about the issues you have been having with ab15481 in IHC-P. As we discussed I am sending you a new vial of this antibody from a different lot as a free of charge replacement. Your new order number is *******. Sorry for the delay in contacting you with regards to this query. We have a number of pairs of mouse monoclonals which can be used to detect the under or unglycosylated form of MUC1 (for example ab10117 which can be paired with HRP conjugated ab24471). 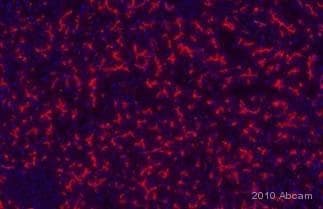 However if you are interested in the glycosylated form of MUC1, unfortunately we have not tested any antibody pairs in order to detect this form and therefore cannot guarantee that it will work. However, form the pair which you presented, ab28081 has been tested in ELISA with human protein and should therefore be suitable for this application. However, I cannot be sure that the rabbit polyclonal ab15481 will work as it has not been tested in ELISA before and has only been used in applications where the immunogen may be in the denatured form. Two possible alternative would be ab79226 which recognises the Y1229 phosphorylated form (cytoplasmic) or ab14690 which again recognises the underglycosylated form (extracellular) but have both been tested using ELISA. 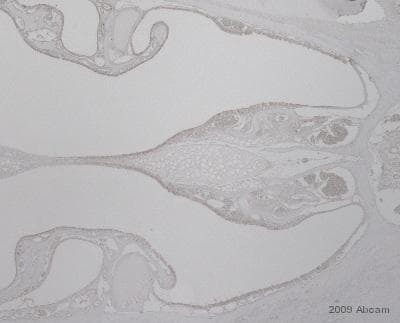 Alternatively, ab80952 is an Armenian Hamster monoclonal reactive against the cytoplasmic tail of MUC1, or ab37435 which is a rabbit polyclonal, again directed against the cytoplasmic domain. 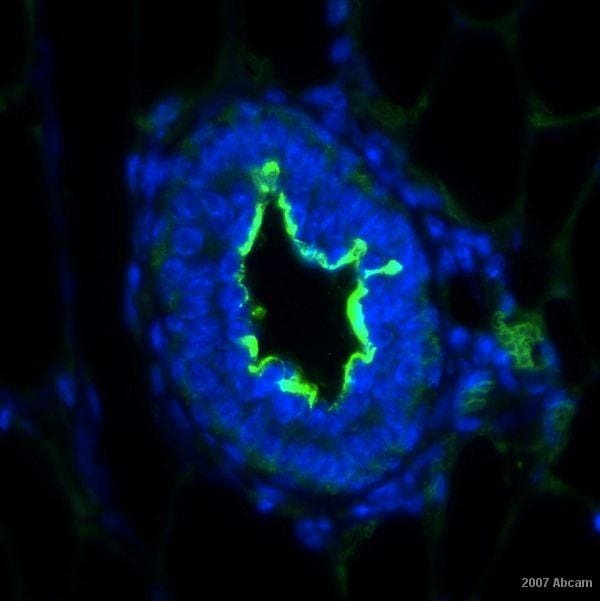 Alternatively ab45167 is a rabbit monoclonal which recognises the extracellular domain but only of isoform 7 or MUC1. These have been used in flow cytometry and immunoprecipitation and are therefore more likely to be able to detect the native form of the protein. If you would like to test ab15481 as you suggested (or any of the other antibodies suggested which have not been used in ELISA yet), as it has not been used in ELISA before I can offer a testing discount. This would involve you purchasing the antibody, using it and letting us know the results via an Abreview (positive or negative), you would then be eligible for a free primary antibody of your choice from our catalog. 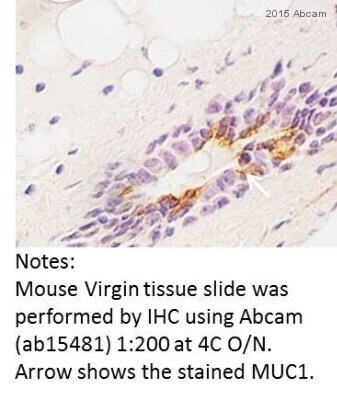 More information on this offer can be found here: www.abcam.com/collaborationdiscount If you need a secondary antibody for this application we have a very easy to use search engine to allow you to find exactly what you are looking for: https://www.abcam.com/index.html?pageconfig=productmap&cl=918 If you would like any further information, help in choosing a suitable secondary antibody or you are interested in applying for the testing discount please do not hesitate to contact me.